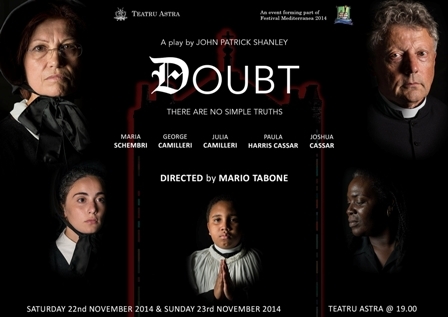 Doubt is a drama written by John Patrick Shanley. It is about a strict nun who believes that a priest has done something terribly inappropriate to one of the students. Bronx, New York - 1964. The play takes place, mostly, in the offices of a Catholic School. Based upon a few circumstantial details and a lot of intuition, the ultra-stern nun, Sister Aloysius Beauvier believes that one of the priests at the St. Nicholas Catholic Church and School has been molesting a 12-year-old boy named Donald Muller, the school's only African American student. Sister Aloysius recruits a young, naive nun (Sister James) to assist her in monitoring the suspicious yet charismatic Father Flynn. She also addresses her concerns to Donald's mother, who surprisingly is not horrified or even shocked by the allegations. (Mrs. Muller is more concerned about her son getting into high school and avoiding a beating from his dad.) The play concludes with a one-on-one confrontation between Sister Aloysius and Father Flynn as she attempts to get the truth out of the priest.